Flip Out Mama: Say Hello To Redakai! You Better Get Used To It! I recently found out about an awesome new card game that is going to ROCK Tater's socks off! It's called Redakai,and it is made by SpinMaster Toys. (You know them! Moon Sand/ Tech Deck/Air Hogs/ Bakugan? ?That's them!) It's based on the new Cartoon Network show Redakai: Conquer the Kairu that debuted in late July. 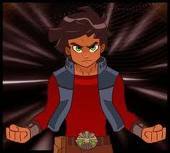 The show is based on a 15 year old character, Ky, who is a student of ancient martial arts. He embarks on an amazing quest to find the Kairu, which is a primordial alien energy force. Ky and his two friends travle the world looking for the Kairu, in order to protect it from extraterrestrial teenage opponents. His hope is one day to become the greatest Kairu warrior, a Redakai! He is still a little young for the whole card part of the game, but he is learning it fast! He has a couple of older friends who live near us who are into it too, and they are more than happy to teach him! 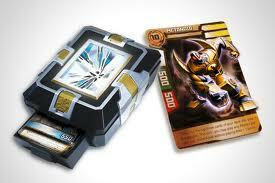 The Redakai cards are really cool, very awesome looking. Some of them have a really neat 3D effect. After I got the scoop on Redakai, it really is pretty simple, and I felt kinda dumb that I didn't understand it sooner! Here's a little breakdown for ya! At the beginning of the game, you choose a character card. That will be your "player" throughout the game. 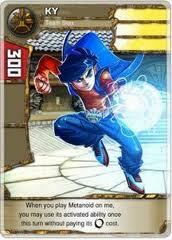 Your opponent will try to "attack" you by using attack cards laid on top of your character card. 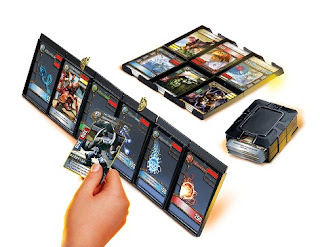 Along with attack cards, there are also "monster" cards that you can layer on top of your character card to transform your character into a more powerful monster. It really is pretty cool once you get the hang of it! Redakai has been voted as one of the top toys of the year, and will definitely be a hot ticket for the holidays real soon! So, if you have boys in your life, you might wanna check it out! It's not going anywhere! If you wanna check out Redakai for yourself, and get a head start on what your kids are gonna be asking for this year, just click here!